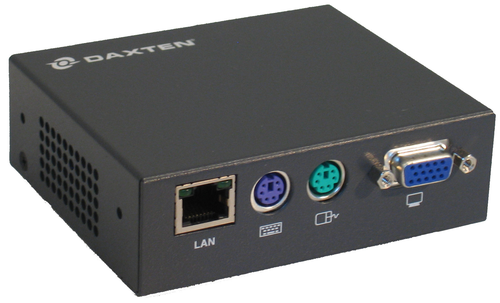 The Daxten Voyager IP is a cost effective, harware based remote access solution for administrators and consultants. Allowing unrestricted access to remote servers or computers and serial devices as well as giving access to any analogue KVM Switches. The Voyager IP supports all manufacturer's KVM Switches for easy remote access to existing systems. The most interesting aspect of the Voyager IP is that even serial devices, like firewalls, network switches, routers and intelligent power strips can be remotely accessed from a web browser. IT service providers no longer have to make costly trips to customer sites to fix or repair software issues or reboot systems. This cost effective solution is ideal for those that have remote analogue KVM Switches and active network components that need to be administered from time to time. Signal compression for real-time video transfer is one of the numerous features in the Daxten Voyager IP extenders that allow for crisp, images even over long distances. An integrated serial port allows the connection of serial peripherals like routers, switches, firewalls etc. All signals are transferred with SSL for secure transmissions.